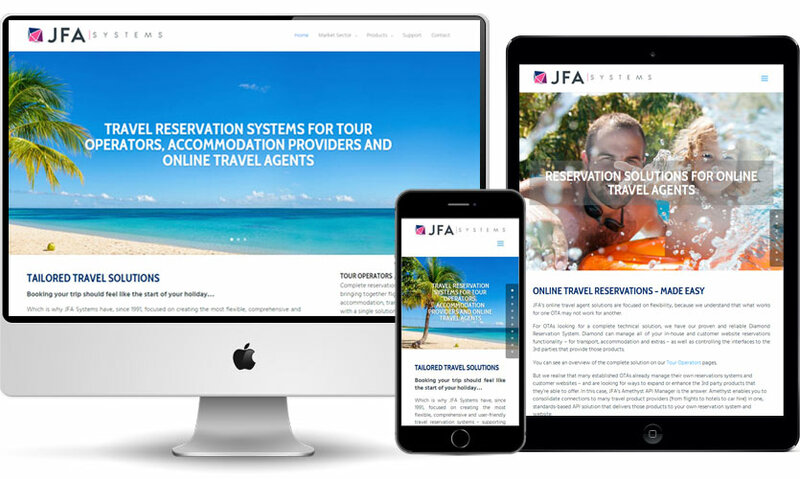 JFA Systems Ltd are specialists in creating software solutions for travel and accommodation reservation systems for Tour Operators and Online Travel Agents. JFA were looking to completely refresh their corporate website as part of a broader rebranding. The JFA website is a custom Blackbox design, using a new logo and corporate branding designed by the excellent team at Ditto Creative. The website is fully responsive, designed to adapt to users’ different device types. You can see the live JFA website here. “Right from the start Paul at Blackbox design took the time to get a detailed understanding of our business and the industry we are in. Paul worked closely with us throughout the whole design phase, always keeping us informed on progress and discussing any key design or architecture points. Paul’s deep understanding of website usability really helped guide us though the whole process, and helped ensure it was correctly geared to our target audience. We have had really positive feedback on the new website. It was delivered on time and on budget with a seamless switchover. Overall, we are very happy with our new site and the service we received from Blackbox!” Adam G., Managing Director, JFA Systems.